Situated on 240 acres along the Thames River in scenic southeastern Connecticut. Three of the world's most amazing casinos, Casino of the Earth, Casino of the Sky and Casino of the Wind, are just steps away. There are nearly 5,500 slot machines and nearly 325 table games, including favorites like Blackjack, Roulette, Baccarat, Craps and Pai Gow, Poker, and state-of-the-art Race Book. Become immersed in the bells and whistles of the nearly 5,500 slot machines that will thrill your senses. With 42 tables in a state-of-the-art room, Mohegan Sun's Casino of the Wind is the East Coast's premier destination for poker! Featuring an array of games such as Omaha, Texas Hold 'Em and Seven-Card Stud, Mohegan Sun's got the game for every enthusiast. It features over 39 delectable dining options. With a wide variety of dining choices comprising more than 3,000 seats, every culinary expectation is exceeded at Mohegan Sun. Whether it's a delicious Italian feast at Pompeii and Caesar, a quick bite with the family at Chief's Deli or a gourmet meal prepared at Michael Jordan's Steak House, Jasper White's Summer Shack or Todd English's Tuscany, nothing is left to chance. 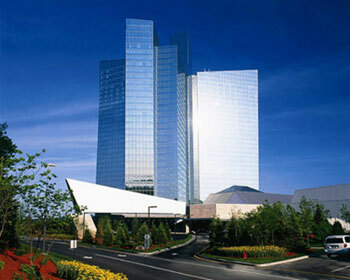 The Shops at Mohegan Sun, a 130,000-square-foot retail shopping experience. More than 100,000 square feet of meeting and function space, including the Northeast�s largest ballroom. A 17,500-square-foot outdoor sun terrace.